Here in Korea, for a business trip regarding Wonderchef. Left home on Friday, reached here and spent yesterday in Seoul…it has this eye opening high density landscape, just a vast array of skyscrapers! The city is fast, Mumbai seems slower. Have to catch up with the meetings scheduled for today in Busan, or Pusan as some still call it, and have to take some time off in the evening and explore the place a bit. Busan is just like Seoul, a busy metropolitan city of South Korea. Back in home, the kids are busy preparing and studying for the half yearly examinations that begin today…As is the case always, Alyona will be cooking their favourites. World Heart Day falls on September 29. It is being celebrated nationwide by the Billion Hearts Beating Foundation, 3 year old initiative of Apollo Hospitals. The Billion Hearts Beating aims to make 1 billion Indians truly aware of the fact that heart issues are not just genetic but also can be controlled through lifestyle. 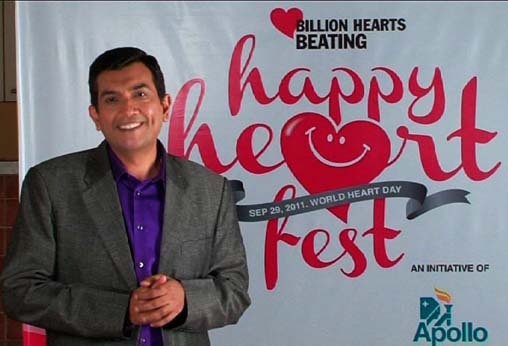 As an integral part of the 5 day run-up to the World Heart Day on September 29 , the Foundation is planning a series of activities on-air and on-ground, as part of the Happy Heart Fest. There are 5 Controls identified that if followed, make the heart stronger. These are an Active Lifestyle, Cut Smoking, Regular Health Check-ups, Beat Stress and a Healthy Diet. 5 Crusaders have been selected to represent one control each. 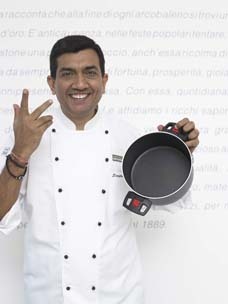 Chef Sanjeev Kapoor is one of these 5 Crusaders, to propagate awareness about a Healthy Diet for a stronger heart. He will be sharing his 10 favorite cholesterol free recipes with health tips for a healthy heart as part of this initiative. His top 10 health + taste vignettes will be visible on www.billionheartsbeating.com. Along with Chef Sanjeev Kapoor, various other celebrities are coming forward pro-bono to make this endeavour a national movement. They include celebrities like Anoushka Shankar (sitarist), actor Ayesha Takia, youth icon Rannvijay Singh, health guru Mickey Mehta, and many others. The activities include subsidized check ups across Apollo Hospitals, cholesterol free cooking workshops on ground, the world’s largest Ash-tray to go around Delhi University to invite youngsters to stub their cigarettes, and a host of top musicians to come together to sing a CALM SONG, a bid to leave stress behind at the end of each days. This will be launched against a red-lit Charminar at a high impact Press Conference, attended by celebrities, Chef Sanjeev Kapoor, and various other luminaries like the Chief Minister himself. Each day of the week is loaded by celebrity presence, representing causes and activities. Enjoy some heart friendly recipes today! Biryani recipes are always welcome, the more the merrier, because biryanis are visual delights – a beautiful array of long-grained rice, tender meat, pungent spices, flavourful nuts and most often, orange strands of exotic saffron. A good biryani will typically depend on a good biryani recipe. A biryani is best prepared by a method called ‘dum dena’ : dum literally means breath and the process involves placing the semi cooked ingredients in a pot or deg, sealing the utensil with flour dough and applying very slow charcoal fire from top, by placing some live charcoal on the lid and some below. The magic of dum is the excellent aroma, flavour and texture which results from slow cooking. Let me take you on a whirlwind tour into the world of biryanis and be prepared to have your mouth watering as you read on. Yakhni Pulao: If it’s a Nawab who is judging a biryani competition, Yakhni Pulao would get all the prizes! Biryani is the ‘country-cousin’ of this exalted pulao which is basically an aesthetic blend of rich mutton stock, aromatic spices and rice. Inclusion of mutton pieces is optional as the mutton stock is enough to make a flavourful meal. Many biryani recipes like Kachche Gosht ki Biryani, Brown Rice Biryani with Chutney Chicken are easily available on the website http://www.sanjeevkapoor.com and you might just come across some other unusual ones too!